I recently bought an 09 GT convertible.. This weekend a friend that owns a tire/wheel business asked if it was a CS because the wheels that are on it are CS wheels. The wheels are the polished 5 spokes - I don't know if they are actually CS wheels, or if these were also "stock" on GTs or what. What other differences are there in a GT and a CS? On the real CS's the car would have the special front and rear bumpers, 2 tone interior (Black/Dove or Black/Parchment) and side scoops. All of these things can be cloned on a regular GT but for the 2007 and 2008 GT/CS on the blue data tag inside the drivers door the TP/PS code would have an "X" in it to indicate a black satin side stripe. But you can always look up the window sticker with the VIN to be sure. Mine doesn't have a 2 tone interior, and the best I can tell it's the standard front and rear fascias, so I'm guessing mine is a GT. It's also possible that he was wrong in calling these "CS wheels". +1, also if black carpet with a dove/black or parchment/black dash with black carpet, non gt/cs have dash color carpet excluding icap, ptp packages. Last edited by 2005GTDELUXE; 7/6/11 at 02:35 PM. I have two CSs, each came with the 18x8.5 polished aluminum "Bullitt"-style wheels, which I eventually sold to "plain-GT" owners. Seems to me the same wheels were an option on the GT list, so could be ordered. Wheels are the last thing I would look to for identifying a GT/CS - or any other change on a Mustang theme. If wheels were definitive, I'd have a Parnelli Jones Edition 2008 convertible and a GT500 2009 coupe. No such luck - but there are the wheels. Last edited by frank s; 7/6/11 at 04:11 PM. Then there are Shelby GTs like mine below with the same wheels, that begins with the GT Upfitters (54U) Package, which includes the CS type front and rear fascia, just to confuse you more. 54U was spoiler delete so does that mean you drilled holes and put that spoiler on? Yes, I drilled the holes myself to install the OE GT500 spoiler. I just like Mustangs with spoilers. Thanks for the compliment! Not sure if the gt/cs ever offered a spoiler delete. Last edited by 2005GTDELUXE; 7/8/11 at 05:05 PM. The GT/CS was offered with the spoiler delete was an option for 2007 - 2009 but I do not have a documented 2007 with the spoiler delete option so far. 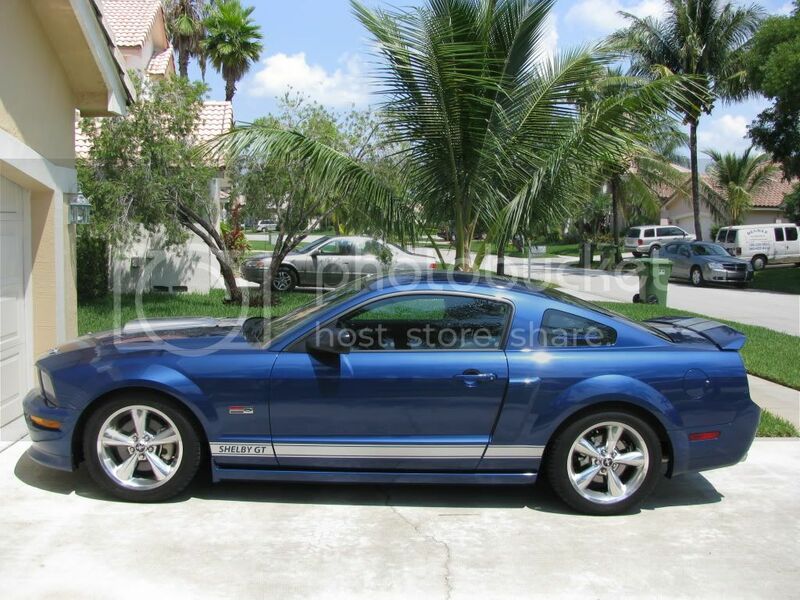 I have a few spoiler delete GT/CS's for 2008 & 2009. To further confuse things: Some CS's came with a hood scoop, some didn't. But Ron's list is a good starting point. 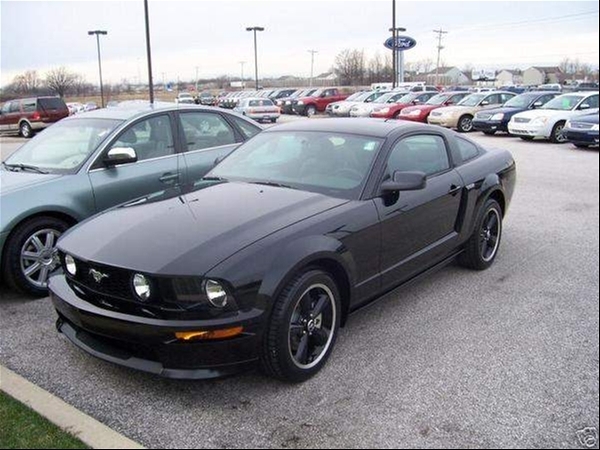 The hood scoop was an option package on the Mustangs called the GT Package. It was the GT Appearance Package (GTAP), and I think it only gave you the hood scoop, plus rolled chrome exhaust tips (which the GT/CS already had). Scoop, tips, and the plenum shroud with pony. Yes, I forgot about the engine cover. 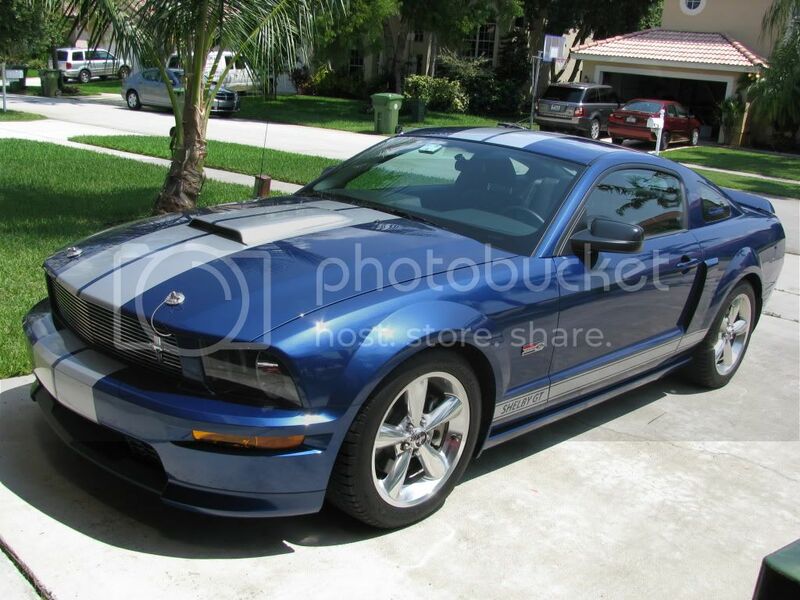 Mustang expert advice needed: type of mustang blue!